The New Image Two-Piece Drainable Ostomy Kit by Hollister, provides you with the items you will need for one pouch change. 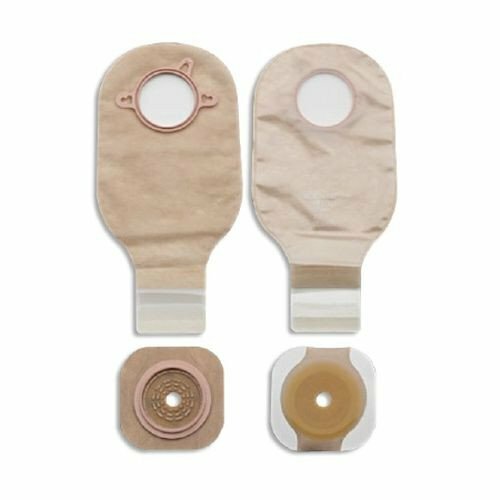 The kit includes a pouch, FlexWear Barrier, stoma measuring card and closure of your choice, a clamp or Lock 'n Roll Microseal Closure. The Lock n' Roll microseal closure features plastic interlocking fasteners that come together and the curved beige clamp simply snaps together to close the bottom of the pouch. The kit comes with a FlexWear barrier in four flange sizes that are color coded green, red, blue and yellow and works with the provided corresponding color-coded pouch. The opening is cut to fit to achieve a custom stoma fit. The design also floats to not add pressure and the patented locking mechanism gives an audible click giving assurance that it's secure. 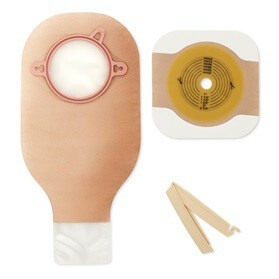 Having a two-piece system makes it easier to change since the barrier doesn't have to be removed or disturb the stoma. The kit is available with or without tape border on the barrier. The tape allows for extended wearing with its excellent adhesive properties that can hold up for more than a day. Both sides of the pouch are made with ComfortWear panels for a soft, cloth-like experience against the skin. To control odor, Hollister adds a specialized clear film as a protective barrier. You may also apply lubricating deodorant to neutralize odors. 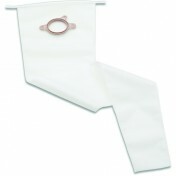 The drainable ostomy pouches are latex-free with sterile and non-sterile options. The kit comes in a box of 5 or purchase a single kit if you would like to try it out first.